A bunch a yous have freshly subscribed to the blog! Cheers, Howdy, & Welcome! That said, you may have missed our latest press, so, previous loyal subscribers, you might get this one twice – we got a write up in the Press Democrat by Dani Burlison! And word on the street is that we will have a short write-up in this Sunday April 3rd Towns section Hard Copy. This is HUGE in the world of grassroots startups. Yay back at Dani on behalf of ToolGrrlz! On the burner (in the toolbox): REPURPOSING SHIPPING PALLETS…From Start to One of Many Finished Projects ~ coming soon! Literally! Dani Burlison, who utilizes her fabulous talent as Santa Rosa’s correspondent with the Press Democrat did a write up on ToolGrrlz in the Towns section on the PD’s website. It may also be in the hard copy coming out on Sunday, March 27th ~ tomorrow! Cross yer fingers! Cheers to you Dani! 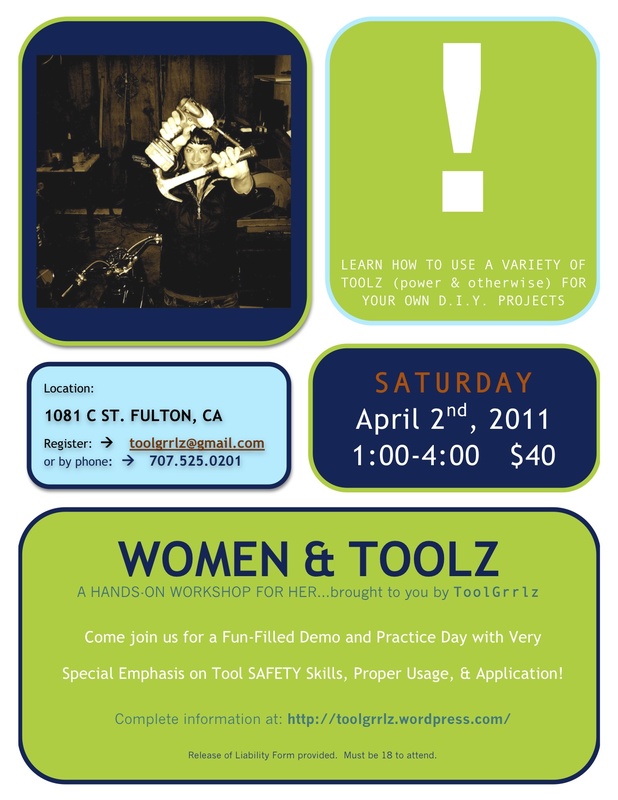 Thanks for helping make ToolGrrlz & her workshops a success!